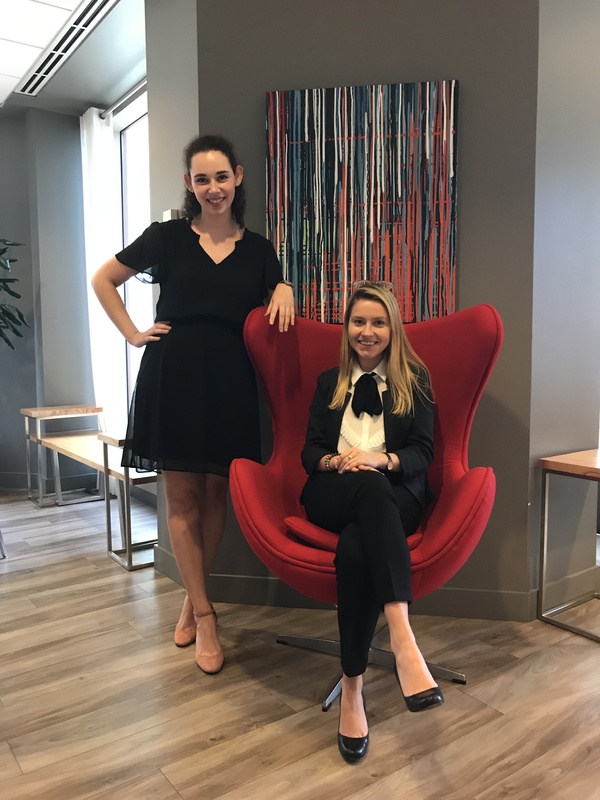 As the summer is sadly coming to an end, we’ve had lots of law students reach out to us about our experience going through the wonderfully natural OCI recruitment process. 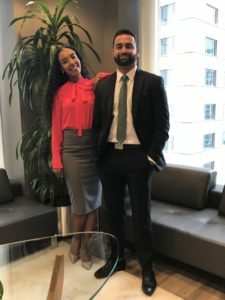 With the application deadline coming up in less than a week, we decided to share some of the wisdom we’ve been able to gather from other OCI veterans and by reflecting on our very own, not so distant, experience on the OCI rollercoaster! “Before the applications are due (or even after, as you learn where you will be interviewing), reach out to people from firms. You do not want to overdo it (that is, don’t speak to five people at every place that you are applying), but the more people you get a chance to chat with, the better you will be able to see what sets the firms apart, and the better you will be able to know where you want to work/where you would fit in. There is no such thing as asking too many people to read your cover letters/resume. If you haven’t already, reach out to upper year mentors, friends, family, pets, whoever is willing to give you the time. When drafting your cover letter, tell a story. You want to draw the reader in, make them interested in who you are, and say something separate from what is in your resume. Focus on specific experiences that illustrate the skills that you want to show to firms (and show that you have the skills, don’t just tell the reader that you do). “My biggest tip for OCIs would be to go in with no expectations and no favourites. There’s no need to put more pressure on yourself for certain interviews than others. Treat each equally, that way you’ll be sure to show your best self to every firm and not crack under the pressure. The less expectations you have of what will or should happen in the interviews, the better. Bring Listerine Strips. Use them in between interviews, it keeps the mouth moist and the breath fresh! Write a quick sentence about something you talked about in the OCI on the back of the interviewer’s business card as soon as you’re done. This will come in handy when you’re trying to personalize thank you emails later. Do you find that in your department the work comes in waves or are you constantly fairly busy? What was your favorite student event in the summer? “I think it’s important to remember that there is no one way to get through the OCIs. 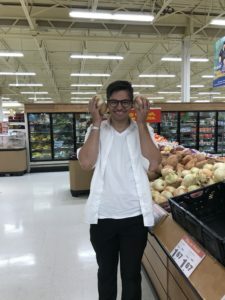 Everyone in our summer group was their own unique and interesting person, which goes to show there is definitely no single type of ideal candidate. So, my advice is, in preparing for the recruitment process, know the story that you are trying to tell about yourself. “Be as energetic and engaged as you can be. You’ll be super tired but push through it. Also, no such thing as being too prepared. 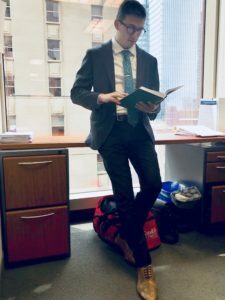 Try to at least know some information about every firm you interview with, including whether they have rotations for summer students, areas of practice, etc. “Try to have fun! I know this sounds strange, but looking at the OCI process as an opportunity to meet interesting people and to learn about their careers and unique paths to law helps to change the anxious, nerve-wracking job interview vibe to a more relaxed and exciting one. If you have any specific questions about the recruitment process, we’re happy to answer them. * Check out our Cassels Brock & Blackwell student webpage at http://students.casselsbrock.com/ for our contact information. *This offer expires Friday, August 17, 2018, at 12:00pm 6:30pm. With only one week of work left this summer, we couldn’t be happier sadder. While the thought of leaving Cassels brings us to tears, it is time to reminisce about our summer experience. 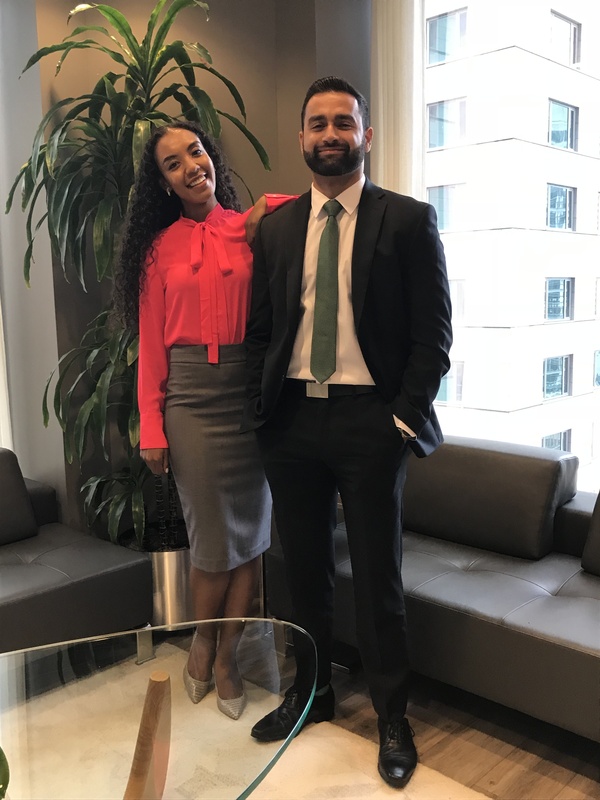 Us summer students have been lucky enough to work on some pretty cool files with some very cool lawyers. 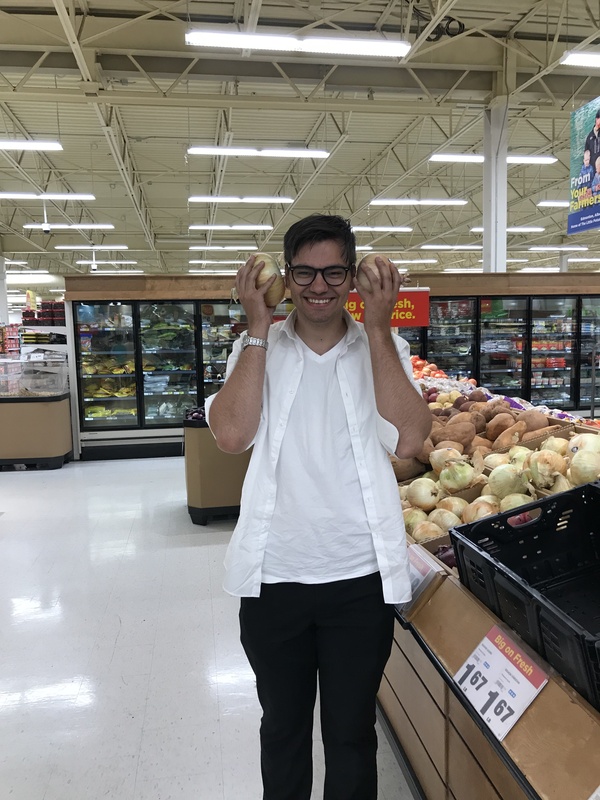 This blog post is dedicated to our favourite work assignments of the summer. Because the students are spread out amongst the floors, we were able to get a variety of work throughout the summer. Every year, the Vancouver Cassels summer students get to organize a charity event of our choice, funded by Cassels! For the past few years, students have chosen to do a Family Meal Night for Ronald McDonald House. 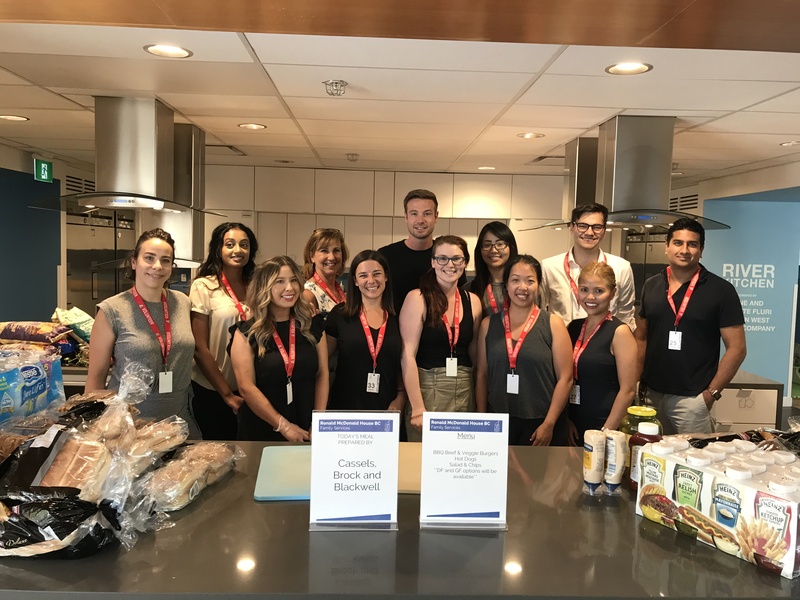 This is one of the many charities which Cassels supports, and the firm sponsors the event by funding all of the food, as well as our time organizing and participating. Ronald McDonald House is a non-profit organization which provides accommodation for seriously ill children, and their families, who must travel to Vancouver to access medical care at BC Children’s Hospital. BC Children’s is the primary children’s hospital for all of BC and the Yukon, meaning that many ill children and their families find themselves in Vancouver without warning, without plans and without a place to stay. Ronald McDonald House serves 2,000 families each year in spacious suites with private washrooms, as well as a variety of expanded services in the house like arts and crafts studios, music therapy, fitness studieos, a LEGO lounge, and shared common spaces where families can come together for company and support. Not to mention, they have a super cool, adult and child friendly slide which you can use to get from the 2nd floor to the first!! As volunteers, we got to tour the facilities, which were beautiful, modern, and incredibly thoughtful. Everything was built with an eye to making life easier, better, and more comfortable for the families living there, with touches like a fitness room with a glass wall looking out onto the play room – so busy parents can exercise while watching their kids play. Out of all of the cool facilities, I think the magic room was my favorite – a high tech room which allows users to be transported into the enchanted forest home of Woody the Beaver. It was truly heartwarming to see all of the hard work and dedication which the staff and volunteers put in to making families feel supported and at home during what must be such a difficult time in their lives. Watching kids using the main common area off the entrance hall as a huge race track for their hot wheels cars before dinner was probably almost my favorite part of the night! As student organizers, we have been prepping for this event since late June, booking the meal night, planning the menu, collecting volunteers from the firm, and, day-of, doing all of the shopping and food delivery. Forrest, Grace and I spent the morning doing a Costco and Superstore shop, which was a super fun student field trip in and of itself! 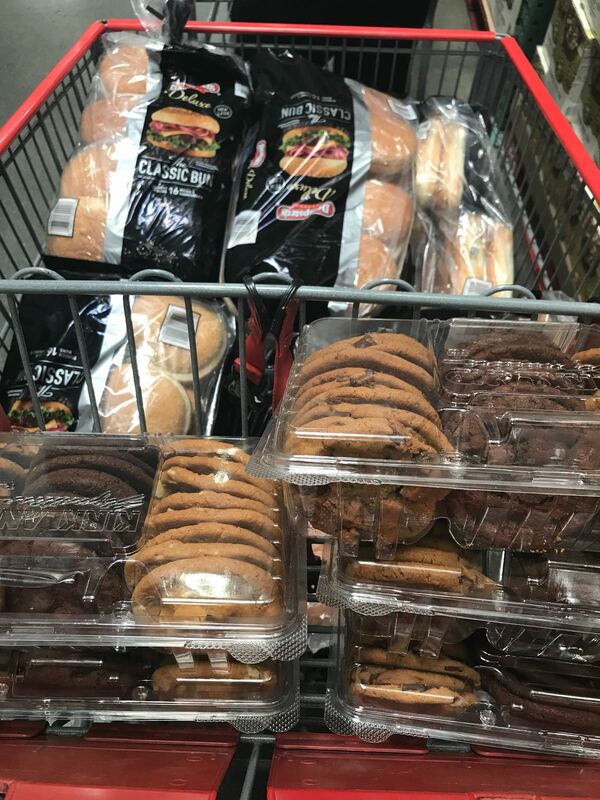 we needed 1 shopping cart just for buns and cookies! 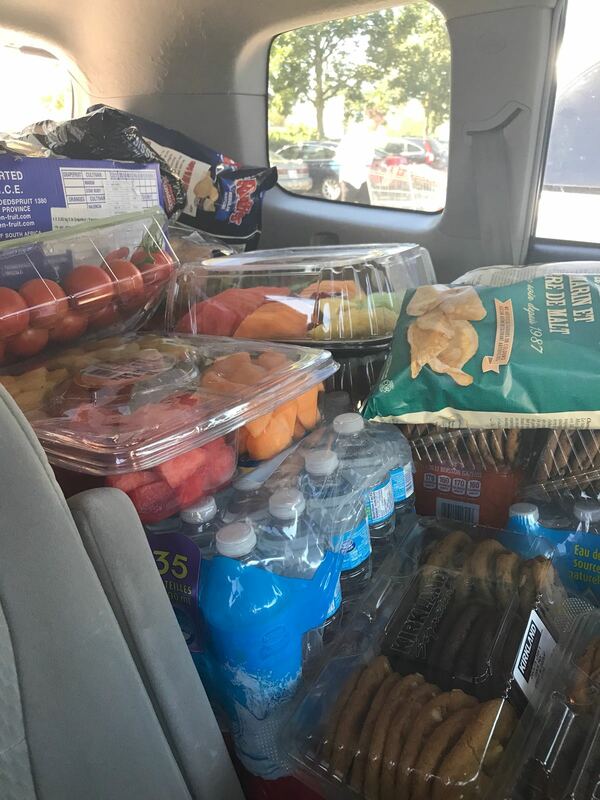 on our way to deliver the food! It was not hard to make it a huge success with the support of the Cassels team – our maximum 15 person volunteer team was filled within two days of the request email being sent to the firm! After some nominal, and likely unnecessary, delegation on our part, the Cassels volunteers jumped into action in three teams – the Grill Masters, the Top Chefs, and the Plating Masters. Everyone put their heart into making sure that a delicious barbecue meal was ready in time for the estimated 100 parents and children who showed up with eager appetites. Watching the huge smiles of kids as they chatted with the serving team and collected their burgers made every moment of preparation more than worthwhile. We finished the day with full stomachs and full hearts. Thanks Uncle Cassels for sponsoring this great event! 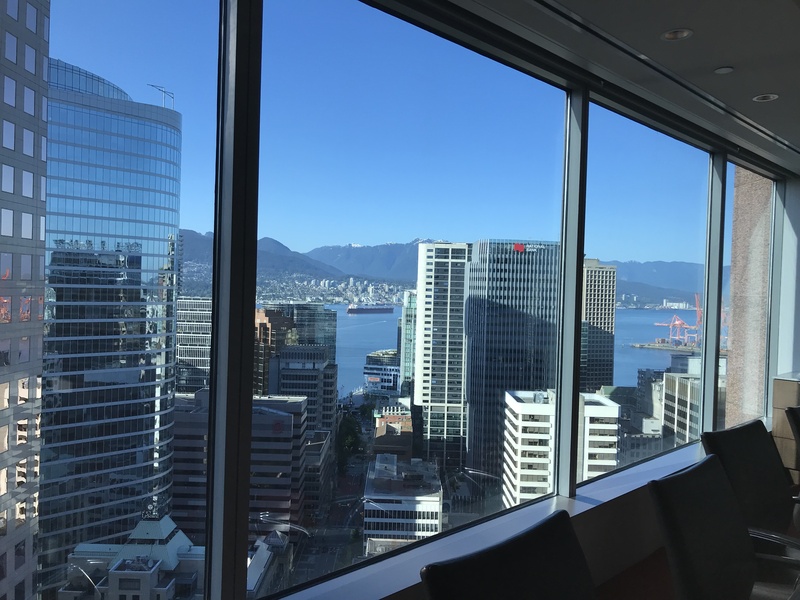 Vancouver office here with our first blog of the summer (sorry it’s a bit late in the game, it is hard to get in time to blog when we are too busy staring at the beautiful view of the ocean and the mountains out our windows). At Vancouver, we have been lucky to have had a variety of social activities to brighten up our summer. 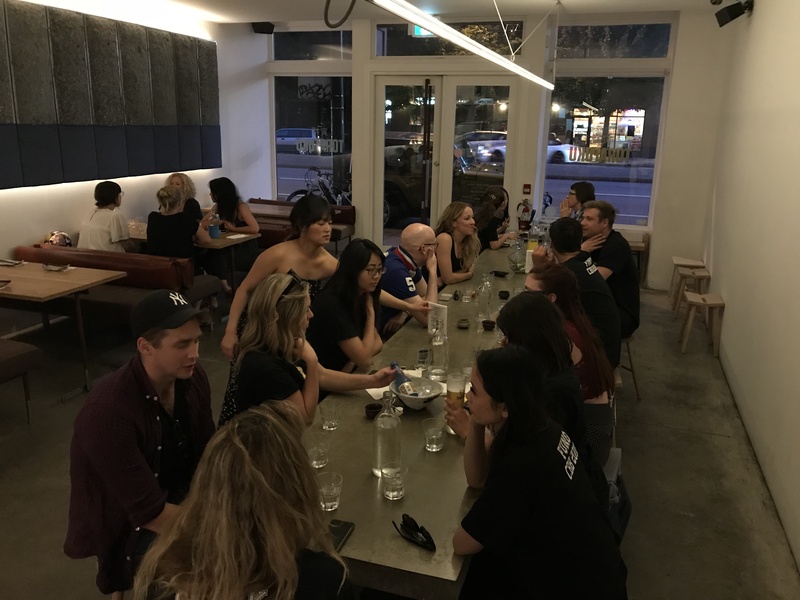 Aside from the welcome lunches, dinners and drinks (if you include Orientation week in Toronto, we’ve been to at least 9) the firm has had several fun socials which students have been welcome to attend. The best part about Tea is that the students get to ostensibly host, meaning we go out and buy the snacks and do the email invite to the firm. The Toronto office may be sponsored by coffee, but here in Vancouver, we are sponsored by SNACKS. Not only are we very invested in getting just the right tea snacks every week, we take at least one group snack break every day where the three of us skip along to the servery to raid the lawyers snacks in the cupboard (we’ve eaten countless bags of m&m trail mix at this point). Every year, the students come up with a theme for the invitations, like writing a haiku every week, or sending out a cheesy beach picnic photo every time. Our ‘theme’ has been to photoshop associates and partners into images that are vaguely related to tea. We kicked it off by testing out that famed Cassels collegiality by photoshopping a partners face onto every character at the Mad Hatters tea party, Disney cartoon version (thank goodness no one here takes themselves too seriously, because we have only gotten worse from there) . We’d love to reproduce some of the invites here, but that’s something you will just have to get hired to see. The brilliant Vancouver associates convinced “Uncle Cassels” to sponsor a summer students and associate fun night. After voting by all invited, a date and activity was picked – Go-Karting at the outdoor race track in Richmond! Everyone showed up day of to find a Cassels team t-shirt waiting for them at their desk (mine had a Pac-Man ghost). A party bus arrived to take the team to the race track in style. 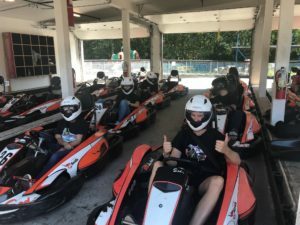 The racing competition was fierce, with at least one litigation associate getting kicked off the course within the first few races. Don’t worry, litigation skills were put to good work and they talked their way back on to the course in no time! Everyone getting psyched for the races! After the race, everyone headed to Torafuku, where Uncle Cassels treated us to an amazing dinner of fusion asian food (and few rounds of sake). The night rounded out fairly late for some of us with drinks and games at the American, where we proved that not only does Cassels have the best lawyers in town, we also excel at throwing a foam football and other types of projectiles into arcade games. At the end of July, the Vancouver office had our summer BBQ party at a Canadians baseball game! We all loaded up onto a classic yellow school bus like a bunch of schoolkids and headed down to the ball game. There, we got to enjoy our own full section of picnic tables, complete with all you can eat hot dogs, burgers and food, and drinks courtesy of Cassels. I have to confess that I was more interested in the eating, drinking and chatting than the game, so I cannot tell you much other than it seemed like our team was losing pretty badly. We also had the added excitement of at least three baseballs coming whizzing into our section at killer speed! Luckily, no one got hit on the head, and I think a few of us went home with a baseball souvenir. 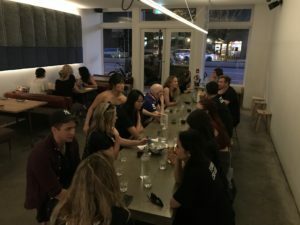 Comments Off on Fun in Vancouver! We’ve got more #fashioninspo for you, with the second edition of 2018’s Fashion Files! When in doubt, stick to the classics. Black and white is always in style, and a staple of every professional’s closet. How do you save time and effort getting dressed for the office? J: By wearing lots of dresses, because a dress is easy to throw on and match with a blazer. I often pair a colourful dress and a black blazer and heels. C: Planning what I’m going to wear the night before helps me get that extra ten minutes of sleep in the morning. What is your go-to place to shop for work? 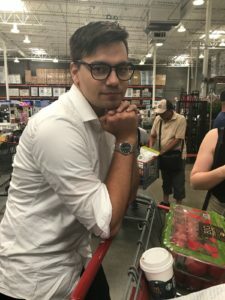 C: Zara, Reiss, and Banana Republic. J: I love to accent with a great pair of shoes. Spill the tea – who is your CBB fashion icon? J: Our very own Ms. Thea Gaertner. C: Robyn Blumberg and Amanda Metallo. We love Kieran’s subtle pinstripe on this navy number. Suits don’t have to be boring! Remember to KISS, “Keep It Simple Sweetheart”. It’s easy to match your work outfit when you have staples in basic colours. Try a plain or discrete patterned navy or grey suit, with a white or light blue shirt. You can find cheap, decent quality ties at Winners, The Bay, and Marshalls at a good price. A watch, matching the colour of the strap with my shoes and belt. Add a pop of colour to your neutral staple pieces to really elevate your fashion game. M: Dresses, dresses, and more dresses! they take a fraction of the time to put on compared to suits and shirts, which helps when racing out the door in the morning. R: Iron all your shirts on Sunday so you’re good to go for the week. M: Le Chateau, Banana Republic, Club Monaco, The Bay are all great options. R: Tip Top Tailers, and Winners for accessories. M: A statement necklace does wonders for an otherwise plain outfit. M: Our very own Corina Capmare. R: Our very own Mr. Nathan “no tie” Pelech. Ed: Please forgive the inside joke, and unless it’s Casual Friday you should definitely wear a tie fellas. In fact, keeping a spare in the office isn’t a bad idea. 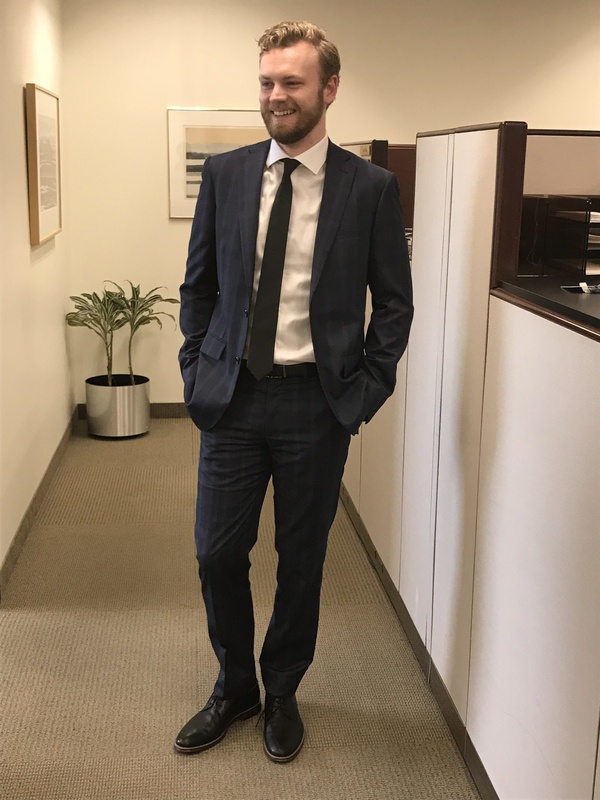 Aaron’s beautiful tie is a great way to accent a classic suit. And brown shoes with navy are always the perfect choice. I like to wear my sneakers to work and switch to dress shoes at the office. This makes my commute more comfortable and it saves my dress shoes from wearing out. Made2Measure does great bespoke suits for a good price. Also J. Crew, and Tiebar is good for accessories.